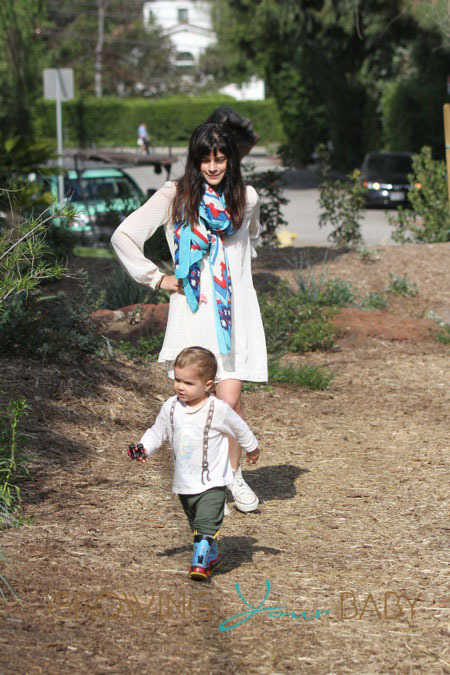 Selma Blair & Son Arthur Hit The Park! Home » Selma Blair & Son Arthur Hit The Park! Fun in the sun! On Friday Selma Blair was spotted out with her son Arthur and some friends at the park in Los Angeles. Arthur arrived at the park in his fancy Tricycoo, which was driven by his mom. With his cute suspender tee, trackpants and Thomas the Train rubber boots on, he then explored the forest area, while Selma followed closely behind. Even though Selma was wearing a white dress and scarf, she wore tennis shoes so that she could keep up with her little guy.